The C.S. Osborne & Co. No. 396 White Rubber Mallet are American made mallets that are built to last. Ideal for any project that requires non marking of the finished product. The # 2 is great for upholstery work, and the # 3 is great for sheet metal and metal roofing work. * White rubber will not mar surfaces. 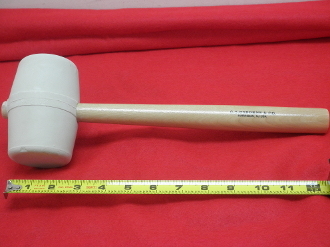 * This superior quality mallet is the finest on the market today. * Solid white rubber head.